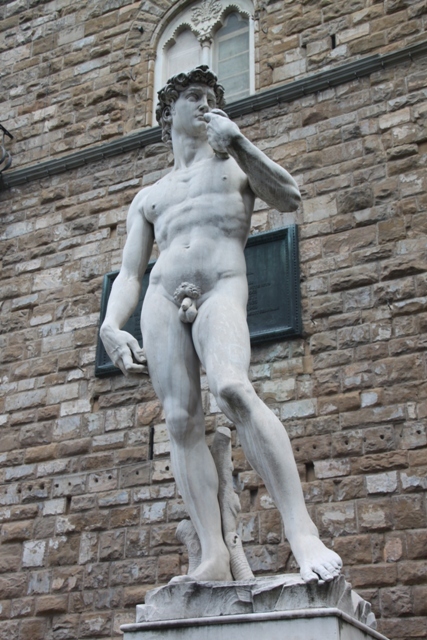 Husband and I visited Florence years ago B.S. (before Son). I remember a mad dash from work on a Friday to catch the flight for a long weekend in the city. We arrived promptly, the luggage did not. Cue a sweltering weekend in totally unsuitable clothing before an exciting reunion with our suitcase on the day we returned home. This time no such hassle, we kept a firm grip on our baggage on board the train from the Cinque Terre. Despite the fiasco I loved Florence last time and hoped this would not change. It didn’t. We all adored this magnificent city crammed with marvels (a supply of fresh clothing does help). Last time we winged it, this time I went into planning overdrive and found it a bit overwhelming. In the end a decision was made to take it steady, not do everything and spend most time out of museums, just wandering and soaking up the atmosphere. This totally worked for us. Son fell in love with Florence too, the beauty of this Renaissance gem was definitely not lost on him and we all agreed this is a great city for kids. No doubt about it Florence is completely overrun with tourists, but then it has been for centuries. I couldn’t help but feel a bit dismayed by the crowds as we emerged from the station, my heart sank and for a fleeting moment I thought we should have gone somewhere else. I got over that pretty speedily. It’s not too tricky to see why people flock here. 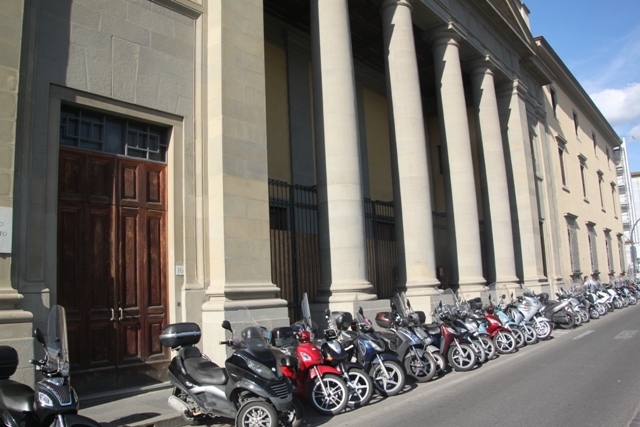 In a relatively small area there are so many Renaissance art treasures on the streets. The entire old town is a UNESCO World Heritage site and running through my head was the fact these streets were once walked by Michelangelo, Boticelli et al. As well as all that good stuff you get great shopping, wonderful Tuscan food and stunning countryside a stone’s throw away. We took a relaxed view and decided to skip the museums. The city centre is traffic free with wide streets perfect for strolling, so that’s what we did – a lot! There are oodles of interesting alleys, colourful markets, beautiful squares and no end of gelato opportunities. You can walk from one end of the historic centre to the other in half an hour easily. We walked everywhere and loved it – no cars but you do need to become adept at dodging mopeds, cyclists and masses of fellow tourists. Climbing to the top of the cathedral is not for the faint hearted – it is tough, tough, tough. There are so many steps, winding staircases, narrow spots and a few tight squeezes but wow what a view from the top – the best one in (and of) Florence. 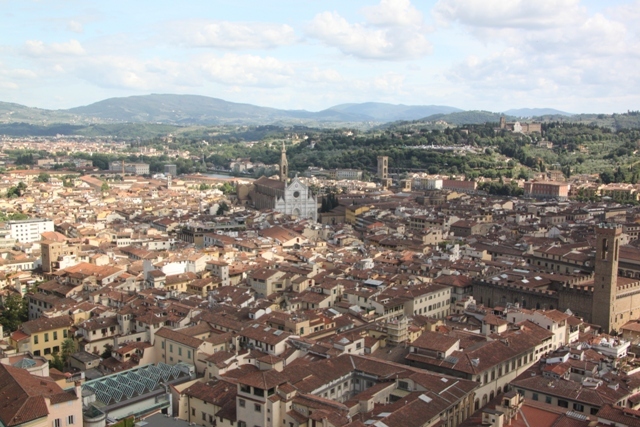 The city in the foreground spread out before you, the hills and gorgeous villas in the distance and a sense of how massive the Duomo is – this is reward and more for all that strenuous exertion. 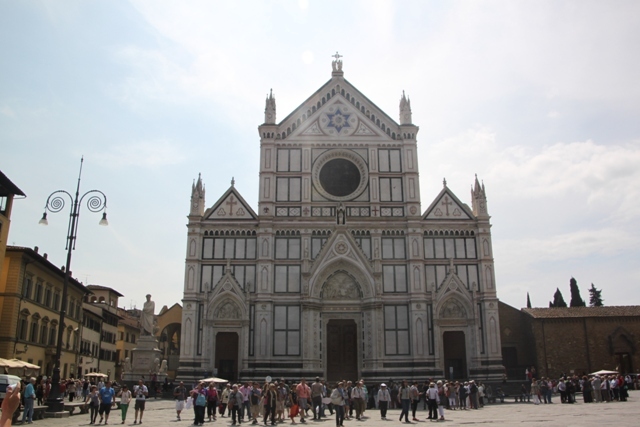 This beautiful church was a first for us, we hadn’t visited last time in Florence but I was so glad we found it now. Quiet, not many tourists and a very sacred and special atmosphere. 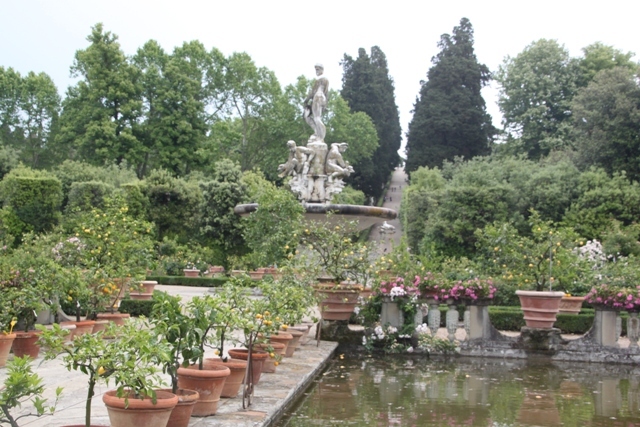 We found the tombs of Michelangelo, Gallileo and a host of other Renaissance heroes – a special place indeed. We loved strolling, wandering and soaking up the city both during the day and in the evening. As dusk falls the street performers start to appear – something to suit every taste it seems. I remember especially a violin duo, a classical guitar player and a rock star performing at night on the Ponte Vecchio. Leisurely walking after dinner with a gelato in hand listening to the music is marvellous. No flowers here but stunning formal lawns and a lovely place to lose yourself away from the crowds and hustle and bustle of the city. We appreciated the more relaxed pace, enjoyed seeing a bit of the Pitti Palace (Medici HQ) and got some amazing views of the city from a different perspective. Last but most definitely not least the Ponte Vecchio was one of our Florence favourites. The oldest bridge in the city, it is interesting by day but I loved it so much more at night. The shops are closed, the crowds have thinned and you get great views as the sun sets over the city. Add to that an amazing street performer in the middle of the bridge, a great mix. Florence is an amazing city, there’s so much to discover. It really never ends, everyday here brings some new little shop or a detail you hadn’t noticed the day before. I’m glad you had a good time, love the pictures too. We loved everything about Florence and I completely understand that if we went back next week we would discover a whole raft of new and amazing great things! Hopefully we will be back one day! It’s such a stunning city and so interesting too Erika, I am sure you would love it as much as we did! Sounds like you all had a great time in the greatest Renaissance city!! What’s next? We had the best time, so much to see and do we couldn’t fit everything in but loved what we did manage. After this lots of day trips, but we are always scheming and planning for the next trip!! I couldn’t agree with you more! I love Florence and walking the streets! Thanks for sharing! You don’t need to do anything else really, just walk and eat gelato – we loved the whole experience! Yes! My kids couldn’t get enough gelato!! You have made me wish that time would speed. I have long dreamed of spending a substantial length of time in Florence and the dream is coming true next May when I have rented an apartment for a month. Seeing your photos makes me realize how anxious I am to get there. Oh no, don’t wish for time to speed up – it will come before you know it!! 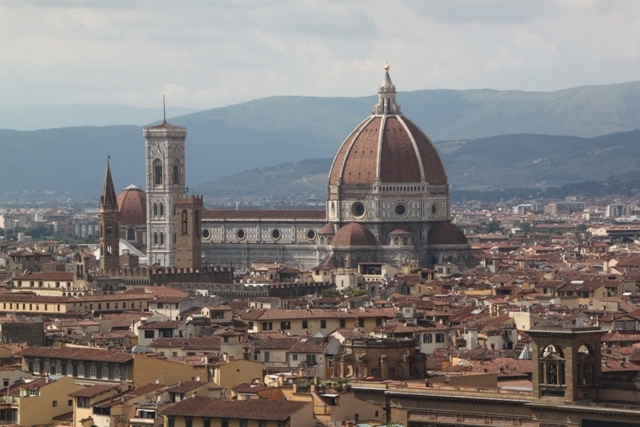 A month in Florence sounds perfect though, completely understand your excitement and anticipation. It is such a gorgeous city – am sure you will enjoy it as much as we did! I have never been to Florence but I would love to see it some day. I didn’t know there were no cars in the centre. That adds to the appeal. When we were in Naples and Rome, we had to develop an almost lemming type system in order to brave the traffic – just diving off the pavement and hoping the traffic saw us and stopped. Last time we visited there was traffic and it was chaos – I remember “diving off the pavement and hoping for the best” strategy and how it was a total nightmare. Although it is car-free there is still a bit of traffic to look out for but obviously nothing like it used to be, definitely makes strolling around a lot easier. It is a gorgeous city, so much to see and do, I highly recommend if you get the chance to visit. Thanks Sonia, it’s a great city. Thanks Steven – I’m very jealous, we went to Pisa before Florence but it’s years since I’ve visited Rome. Looking forward to reading all about it! It probably hasn’t changed that much Rosemary, but definitely worth another visit sometime! We loved wandering around and skipped the museums this time as well because there was so much to see and do. I have many places that I would like to go back to with the perspective of age as well!! Thank you for dropping by and for the nice comments! My goodness. Just look at that top shot. You’re right – it’s easy to resent the hoards, but you do understand it at the same time! 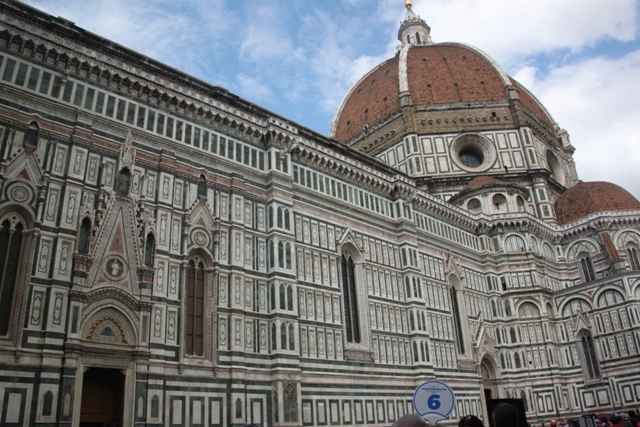 We loved Florence, I just didn’t want to share it with anyone else – still, despite the masses you can have a good time – definitely recommended! When I rule the world I’ll set aside a visit where nobody else is allowed (and you’ll be invited). It is a gorgeous city Jenny. Wow wow wow! Some of the pictures are absolutely stunning, makes me wanna go back to Florence already. Thanks Tom! I know what you mean about Florence – I want to go back too!! You may have already answered this, but what month were you there? It was the end of May when we visited. I loved hearing about your family trip – we had a wonderful short visit in August with our two kids and I am reminiscing. Can’t wait to go back! Cheers to you! Thank you! We loved Florence, glad you enjoyed it with your kids too. We thought it was a great place to bring children and would definitely go back! I found a shop in Florence that sold Venetian glass trinkets for around 10-20 euros each. (this was in 2011) Great for presents! That sounds like a great shop Maria – I love this kind of place! We didn’t really get to browse in the shops too much on this trip (my son is not too big on shopping so it can turn into a nightmare), but I love to bring some little trinket home when we travel – those Venetian glass ornaments would have been perfect!! Loved this place! I remember it being pricey, but oh so dreamy. It is expensive, but we found some really cheap places to eat (the food was fantastic) and basically walked everywhere so apart from buying gelato we didn’t spend too much! We rented an apartment too which worked out good value compared to other options. It’s a gorgeous city – I would definitely recommend, we loved our time there and wouldn’t say no to a return trip! thanks for liking my blog, more travel stories soon! Very inspiring photos. I have never been there. Thank you!! It’s a wonderful city.